Isn’t this a great clean and simple sketch? I love it, so why did it take me so long to make a card with it? I mean I really struggled with this sketch. I felt like everything I was making was too boring and plain. So I ended up fiddling with this card all morning yesterday — adding a little here and there, trying different colors, etc… I have decided that I love other people’s CAS cards, but not so much my own. I can do clean, but the simple part is hard for me. Well enough about my card’s origins — here it is. I have had an obsession with gold lately, so I decided to give silver a chance today. 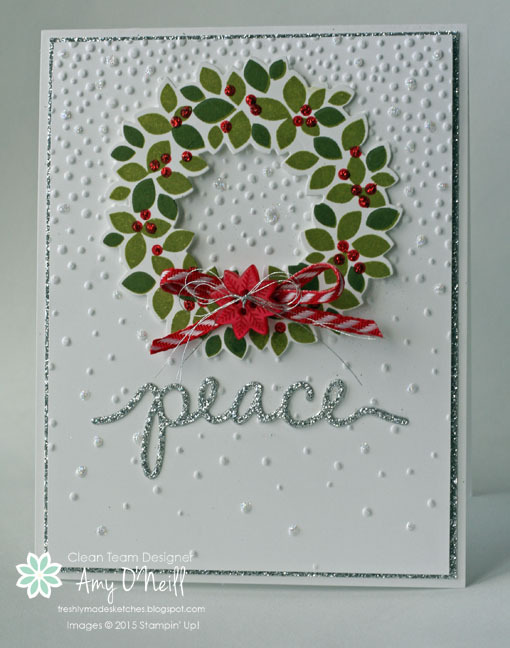 I started by embossing a piece of Whisper White card stock with the Softly Falling Textured Impressions Embossing Folder. I then took my Fine-Tip Glue Pen and randomly applied glue onto some of the raised dots and then sprinkled on some Dazzling Diamonds glitter. It’s hard to tell in the picture, but it adds a little sparkle to the card. 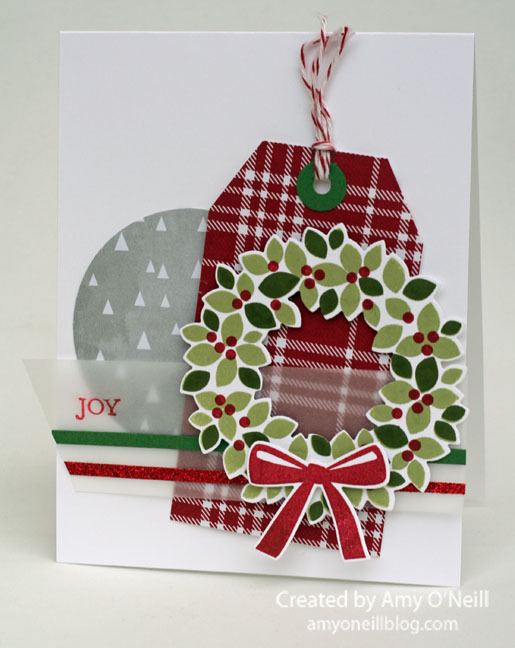 The wreath was stamped with Old Olive and Mossy Meadow inks using the Wondrous Wreath stamp set. I used the coordinating Wonderful Wreath Framelits Dies to cut it out. I added a bow of 1/8″ Striped Ribbon, with a Home for Christmas Designer Button and Silver Metallic Thread. I put some little drops of Cherry Cobbler Dazzling Details on the wreath for the berries. The sentiment was cut from Silver Glimmer Paper using the Christmas Greetings Thinlits dies. We’d love to see what you create with the sketch! This sketch is so open to interpretation. I think it will be fun to browse the gallery. You can see all of the different ways the design team used the sketch over at the Freshly Made Sketches site. I love this Christmas plaid dsp in the Trim the Tree dsp stack. It just looks so warm and cozy. I would love to have wrapping paper like this to wrap all of our presents under the tree. Hmmm….I wonder if I could find that. 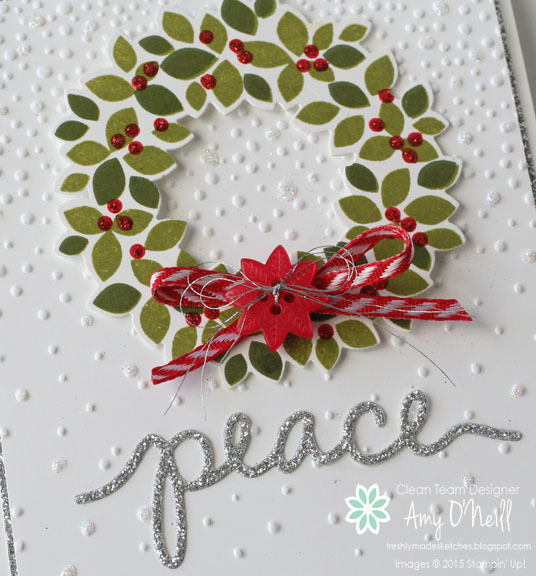 I also love this wreath stamp and coordinating framelits. 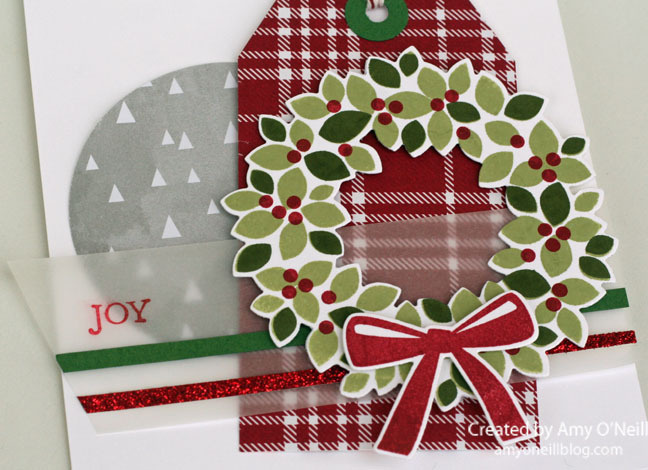 It’s so easy to line everything up — stamping-wise and cutting-wise.